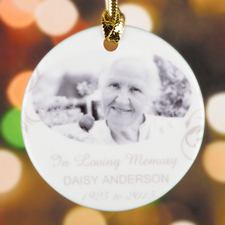 Make a lasting impression with a personalized filigree design ornament. The cute patterns on this piece are smooth and elegant. Available in round and oval shapes. 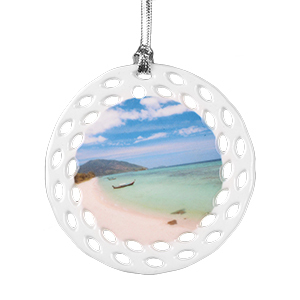 A smooth round ornament that matches easily with any type of outfit. This shape makes it very easy to fit a wide variety of images onto it. Show someone how special they are with this star shaped piece. 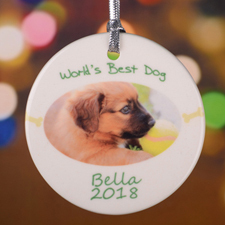 The edge of this ornament has a smooth and polished cut. Add a frosty touch to your outfit with this snow inspired adornment, with its natural and organic cut edges that are great for the colder seasons. This tall oval shaped piece is an ideal shape for fitting portraits of people into. It is ideal for portraits of a single person or couples. There is no better way to make someone feel special than a heart shaped adornment. Our heart shaped piece is cut with smooth and shiny edges. Made of high quality white ceramic. Silver hanging ribbon is included. 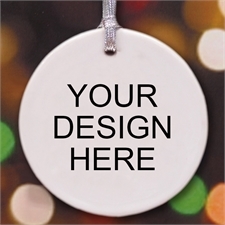 For custom one side: Your design, photo or text will be printed in full color at the front, the back is white colored porcelain. For custom both sides: Your designs, photos or texts will be printed on both sides in full color and extends to edge. Presented in a handsome velvet drawstring bag, making it ready for gift-giving and providing protective storage year after year.